When art and vocabulary intertwine, the pairing is magical. Take a look at English teacher, Paul Moss' utilization of formative and art. 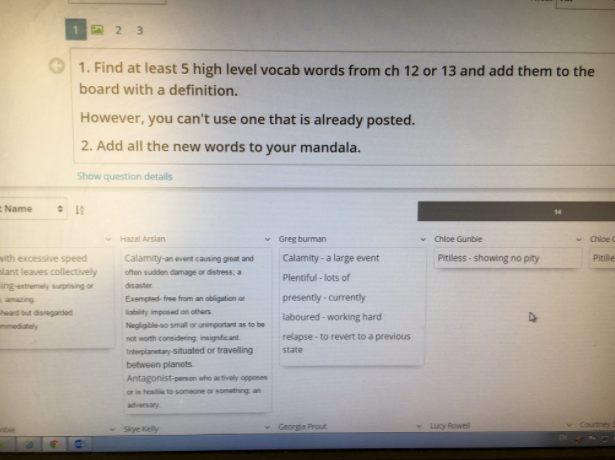 Paul used our short answer feature to have students respond to a challenge he posted on Formative. He shared these results on the board in front of the room and had students reading and collaborating with one another both virtually and face to face. This is one of the best ways to reach all of the learners in your classroom, even those that are apprehensive to participate. An added bonus? Students then had to add their vocabulary words that they found to a mandala that they were creating. Talk about a class that we want to take. Thanks for sharing this with us, Paul. Your creativity is inspiring. Students posting their findings on Formative. Students adding their vocabulary words to a Mandala that they were creating in class.